The Dorian mode is the second of the seven musical modes. 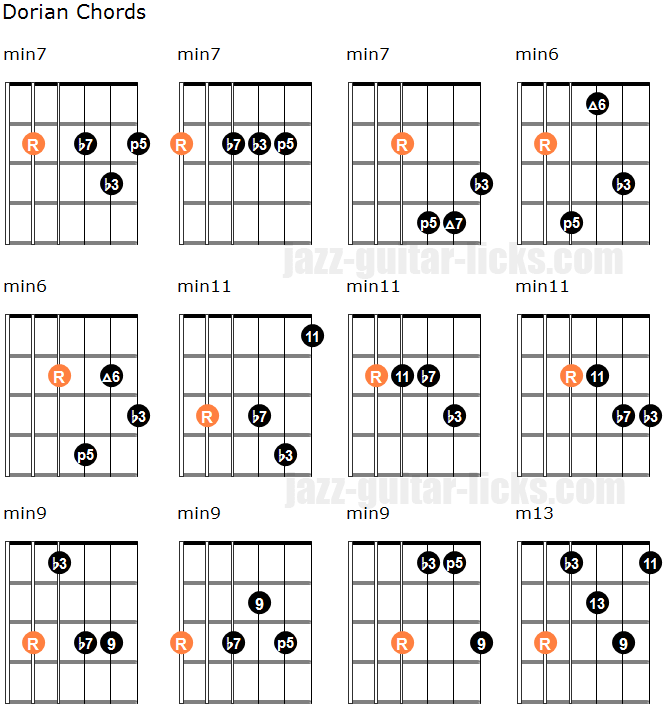 It is a minor type scale because of its minor third (b3), often the first choice to play over minor chords and one of the most important scale to know for a jazz guitar improviser. As you can notice by referring to the scale chart below, the Dorian mode is built with a root (1), a second (2), minor third (b3), fourth (4), perfect fifth (5), sixth (6) and minor seventh (b7). The second, fourth and sixth are respectively the ninth (9), the eleventh (11) and the thirteenth (13). As shown below, the Dorian mode is simply the major scale (Ionian mode) beginning on the degree II. It means that the Dorian mode of C major is D Dorian. Once you know the major scale you know the Dorian mode because they contain the same notes. Now that you are aware of its composition, you should be able to build and play any Dorian scale in twelve keys. Here is a summary chart. You will find four guitar neck diagrams to play the Dorian mode within one octave. This first shape has roots (R) on the E and the D string. The second shape has roots on the A and G string. The third diagram has roots on the D and B string. The fourth shape has roots on the G and E string. To understand and hear the Dorian mode, it is advisable to play these patterns starting with the root note representented by the orange R.
For example, to play the D Dorian mode using the first shape you have to put your first finger on the sixth string at the tenth fret. To play the D Dorian mode using the second pattern you must put you first finger on the fifth string at the fifth fret. Of course, it is very important to play the Dorian mode in twelve keys. You just have to move the root to the desired note keeping the same intervals. The two shapes on the right show how to play the Dorian mode within two octaves in order to cover the strings on the guitar. Once again, try to transpose these patterns in all twelve keys. D minor triad / chord : is made up of a root (D) minor third (F) and perfect fifth (A). Related abbreviated chord symbols are : Dm, Dmin, D-. D minor seventh arpeggio / chord : root (D) minor third (F), perfect fifth (A) and minor seventh (C). Related chord notation : Dmin7, Dmi7, D-7. D minor sixth arpeggio / chord : root (D) minor third (F), perfect fifth (A) and sixth (B). Related chord notation : Dm6, Dmin6, D-6, Dm13, Dmin13. Related chord notation : Dmin9, Dmi9, D-9, Dm9. D minor eleventh arpeggio / chord : root (D) major third (F), perfect fifth (A), major seventh (C), ninth (E) and eleventh (G). Chord Notation : Dm11, Dmi11, C-11. D minor thirteenth arpeggio / chord : root (D) major third (F), perfect fifth (A), major seventh (C), ninth (E), eleventh (G) and thirteenth (B). Notation : Dm13, Dmi13, C-13. How To Apply the Dorian Scale? The Dorian mode is a minor scale, it is played over minor chords as min (1-b3-5), min7 (1-b3-5-b7), min6 (1-b3-5-b6) , min9 (1-b3-5-b7-9), min11 (1-b3-5-b7-9-11), min13 (1-b3-5-b7-9-11-13). Here are some minor chord shapes that fit with the Dorian mode. Try to associate them with the Dorian mode as shown in the first two examples below. In this line you hear the D Dorian mode in intervals of sixths ending with an inverted drop 2 voicing chord (Dm7 - 1 - b3 - b7). This line mixes the D dorian scale with two D minor 9 chords. The voicings for these chords are b7 - b3 - 5 - 9 for the first and b7 - 9 - 5 - 1 for the second. This YouTube video provides 5 easy Dorian jazz guitar patterns.